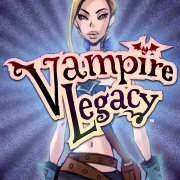 So Vampire Legacy is a typical character building map progressing rpg. You start off as the new guy to town and an old man teaches you how to stop a zombie. But suddenly a vampire kidnaps the old man so now you need to venture out into the spooky forest and find out whats going on, while fighting goblins and ghouls and taking on quests, leveling, gaining skills and these sort of features. Journey into the land of Vampire Legacy: Explore mysterious lands and complete captivating quests! Battle scary and snarky monsters! Defeat other players and friends in the PvP Arena! The strategy that I've found most effective for Vampire Legacy is to kill those no good-nicks, there are a lot of abilities available to develop so be careful of which you choose so maximize your combat capability. And of course the Signet (which costs real money) and gives you +100% exp, Double energy regeneration, Extra gear slot and character and 25,000 gold coins. Vampire Legacy is a slow paced game, so if thats the type of game you like this could be for you. Cartoonie, combat, leveling and PvP (Player vs Player), and more, check it out if your interested. But don't be drawn in by the promise of vampires because if it wasn't in the title vampires would have never crossed my mind.